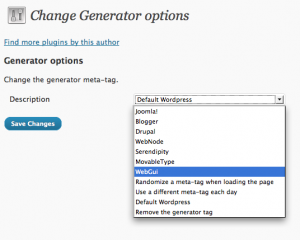 This plugin can be used to change the generator meta tag on your WordPress pages to confuse hackers, script-kiddies, etc. You can choose from a number of common CMS-type products to be listed instead of WordPress, or you can remove the generator meta tag entirely. In addition, the generator meta tag can be changed automatically based on the day of the week (a different one chosen each day), or randomly on each load of the page. Many hacking attempts start by examining the generator meta tag in order to determine what type of software is running on a website and use this information as a starting point for an attack. While not providing any real security against a sophisticated hacker, this could cause automated scripts or inexperienced hacker-wannabes to attempt exploits against a different type of software than the WordPress that you are actually running, thereby reducing the likelihood of a successful exploit. It provides a small, additional layer of security for your WordPress-based site. How does the randomizer feature work with caching? Obviously, if a page is served from cache, the generator meta tag will contain the value that it had when it was cached. Each time the cache is updated, the generator meta tag will also be updated. Generator Obfuscator will not override the cache, but the cache will effectively (and temporarily) override the randomization of the generator meta tag. This is the Generator Obfuscator settings added to the ‘Tools->Generator Obfuscator Options’ menu. This shows a snippet of HTML code showing the generator meta tag as generated by WordPress. This shows the same HTML code, but with the generator meta tag indicating (falsely) that the page was generated by Joomla! The Generator Obfuscator free WordPress plugin is licensed under the GNU Public License v2.0 (GPL2). You are free to use and modify the plugin as you see fit. Hi, this plugin looks good, but where do I find the repo (SVN/git/whatever)? The download (zip-archive) is on this page. The plugin was hosted on WordPress.org (SVN) until one of the core team members strongly suggested that it be removed, to protect WordPress’s branding and because he believes that it confuses their (WordPress’s) userbase about security-through-obscurity versus a vulnerability. Beyond the download listed on this website there is no repository for this plugin.